This is the first thing ever released by Van Conner's own psychedelic/heavy rock project, VALIS - a split with (Van's brother) Patrick Conner's project, Kitty Kitty. There must have been some kinds of psychedelics in the water at the Conner house becuase this split offers up some really trippy tunes that are super rocking and enjoyable. 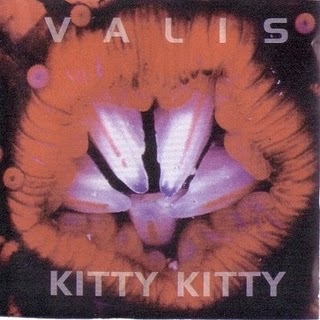 You get 4 tracks from each band, and although the Kitty Kitty tracks are good, the VALIS tracks are what really shine for me on this split; actually, this showcases VALIS in their prime supergroup days and these songs feature none other than Kurt Danielson (Tad) and Dan Peters (Mudhoney). This split was released in 1998 on Man's Ruin Records. DL: "Valis / Kitty Kitty Split"